‘Singham’ actor Ajay Devgn pleasantly surprised his fans with the first look of his upcoming film ‘De De Pyar De’, this new year. The actor was holidaying in Thailand with wife Kajol, daughter Nysa, and son Yug when he announced his romantic comedy via twitter. The film will feature Tabu and Rakul Preet Singh as the female leads. It will be directed by Akiv Ali and produced by T-Series and Luv Films. It is scheduled to release on March 15 this year. Ajay will be seen in another movie, a historical biopic Tanaji. 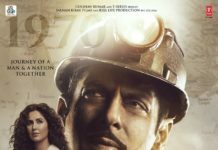 He is playing the titular role and the filmmakers released the first look of the movie on social media on the new year. The film is based on Maratha commander Tanaji Malusare, famously known for his role in the Battle of Sinhagad in 1670 A.D. The first look shows the actor jumping from a mountain, hooked to a rope, sporting a Dhoti and an armor. His half face is covered but the visible eyes have an intense and somewhat angry look. 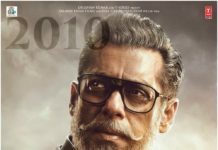 This is not all, the actor will also be seen in two more movies, viz the multi-starrer ‘Total Dhamaal’ and in Hansal Mehta’s ‘Turram Khan’. Ajay was last seen in suspense thriller ‘Raid’ which did well at the Box Office and garnered appreciation from the audience and critics. He also appeared as a cameo role in Ranveer Singh starrer ‘Simmba‘ which is currently running successfully in theatres across the globe. Radhika Apte joins Ayushmann Khurrana’s “Shoot The Piano Player”! Tabu : Don’t want to get stuck in women-oriented films!